ArcGIS was used to develop a new tool for wildlife corridor design. The Automated Design Module populates modeled corridors with optimal vegetation types and patterns to increase wildlife movement. Development of the module represents an application of geodesign in conservation planning. Saguaro and mesquite are among the many plants that should populate the corridors through the Sonoran Desert. Over the last decade, wildlife corridors have become a cornerstone for promoting species persistence within conservation planning. While corridors have become an increasingly viable conservation strategy, issues still remain in translating modeled corridors beyond plans into implementable designs. Although modeled corridors result in the delineation of boundaries, they lack planning and design guidance for programming the appropriate vegetative types and patterns that may be desirable throughout the corridor. This represents a considerable implementation gap for practitioners interested in employing corridors as part of a conservation or land-use planning strategy. This University of Arizona team proposes that a modeled corridor by itself is not a design but rather a first step toward design. Design requires attention to site-specific characteristics; functions; and even more qualitative variables, such as aesthetics, as a means of informing the fine-grained decisions necessary for implementation. 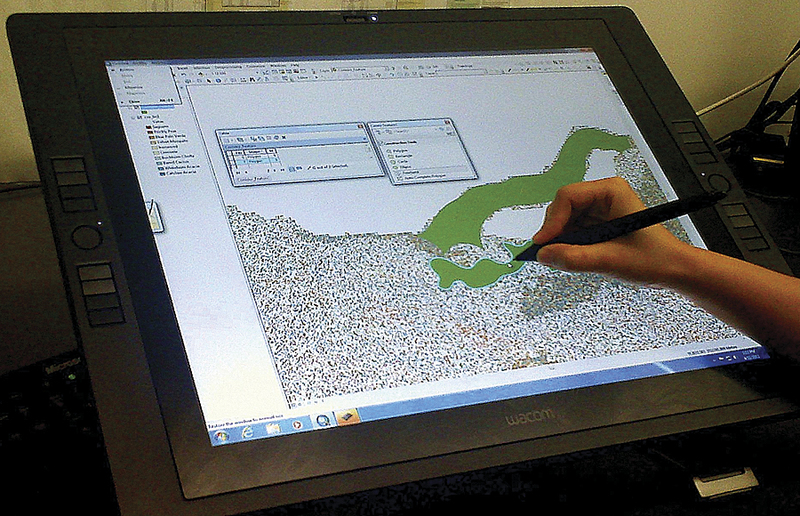 Further, the team believes that the growing field of geodesign holds promise in moving toward this end, as it strikes the needed balance between developing the analytically based methods required in conservation planning and the graphic and communicative language necessary for design implementation. As a result, this article illustrates and discusses the development of a new tool while showcasing the marriage of geodesign with real-world applications in conservation planning and design. Landscape elements are digitized using a Wacom monitor and incorporated as part of the pattern generator process within the Automated Design Module (ADM). Integrating such an interface allows vegetation clustering and linearity to be addressed in the final corridor designs and represents the inclusion of geodesign-based methodologies. The Automated Design Module (ADM) described here was used to inform the design of wildlife corridors within the Sonoran Desert, an incredibly biologically diverse region that spans southern Arizona and California in the United States and Baja California and Sonora in Mexico. 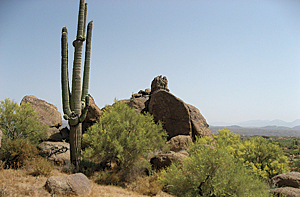 Corridors were modeled between Saguaro National Park east and west. Located adjacent to the city of Tucson, Arizona, Saguaro National Park comprises two distinct districts, which are separated by the city. The wildlife in this area includes the mountain lion, bobcat, bighorn sheep, mule deer, javelina, gila monster, desert tortoise, red-tailed hawk, and the charismatic pygmy owl, among others. The ADM was created using Spatial Modeler within ArcGIS 10. The ADM starts by evaluating the landscape's capability to support various species of native vegetation specific to the Sonoran Desert. Vegetation species include the iconic saguaro cactus, palo verde, agave, cholla, cottonwood, creosote bush, prickly pear, and velvet mesquite, among others. Individual capability models were developed utilizing a standard raster-based overlay process that parameterized landscape characteristics and factors known to impact the distribution and persistence of each plant species. The resultant output of each model yields a capability surface that delineates the portions of the landscape most capable of supporting each plant type. The end result of this process yields a library of scored capability surfaces for each plant type. 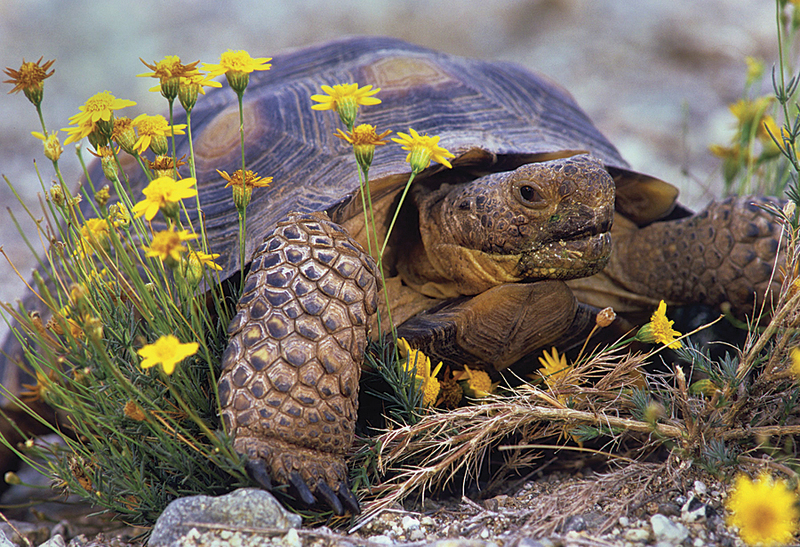 The desert tortoise is among the many animals that would negotiate the corridors. The ADM then employs a selection algorithm that identifies the plant type from the library that exhibits the highest capability score for each cell within the corridor. This results in the selection of the plant type that is most appropriate for each cell. An additional query is then initiated to identify the next best plant type for each cell, and a corresponding dataset for each of these processes is derived. Where cells are equally capable of supporting multiple plant types, a random selection generator is employed to break ties. Together, these surfaces are utilized as the foundation for populating the modeled corridor's interior with the most appropriate site-specific vegetation. The selection process can be further refined based on the requirements of the focal wildlife species for which the corridor is being designed. Individual wildlife species may require varying levels of vegetation diversity and/or density to facilitate movement. As such, vegetation diversity is a parameter within the ADM that can be used to populate the modeled corridor with the desired level of variation among plant types. For focal species, such as the pygmy owl, which requires the presence of saguaro cacti, the ADM can be parameterized to select the most optimal plant type for each cell while still meeting the desired criteria of the focal species. For species like mountain lions, however, which prefer more diverse conditions, the ADM can derive more assorted assemblages of vegetation through employing a random selection algorithm across all optimal and second-best plant types for each cell until the desired level of vegetation diversity is achieved. 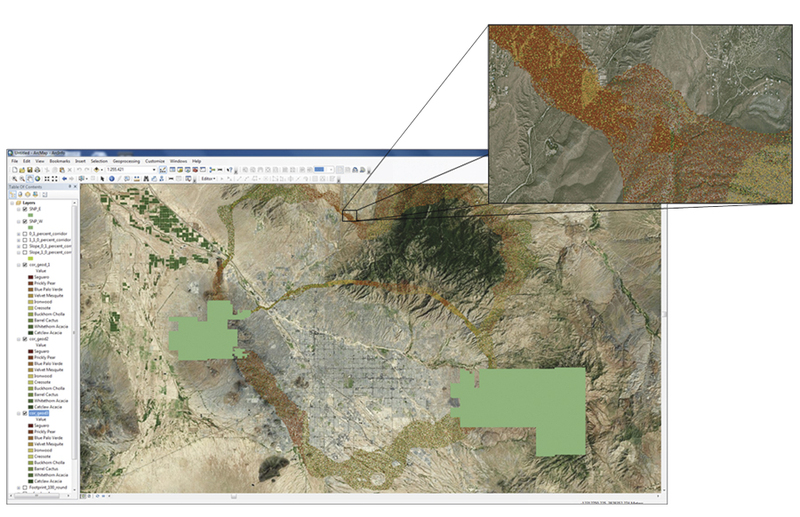 A typical Sonoran Desert scene (top), followed by a modeled wildlife corridor (second), followed by specific vegetation types and patterns generated by the ADM represented as points populating the corridor (third), and a final corridor design as derived from the ADM vegetation library (bottom). The ADM employs a similar selection algorithm for determining the relative density of vegetation within the corridor. For example, the pygmy owl prefers more densely vegetated conditions. When these conditions are desired, the ADM selects and populates all or most of the available cells. Bighorn sheep, on the other hand, are more comfortable with moving through less densely vegetated conditions. In these instances, the ADM drops cells from being populated to achieve the desired condition. Additionally, the ADM can link vegetation density with other modeled connectivity outputs, such as flows of wildlife movement. When linked with current-flow surfaces of species movement, for example, the ADM can be parameterized to populate the corridor interior with greater vegetation density in areas where greater species movement has been modeled, and vice versa. The ADM also has the ability to place vegetation in patterns that are known to either facilitate or impede wildlife movement. A series of pattern generators are employed to alter the relative dispersal, clustering, and linearity of the spatial locations of all vegetation assemblages to encourage movement where it is desirable throughout the interior of the corridor. Conversely, where movement is to be discouraged, the ADM can be parameterized to include linear patterns that have been documented to reduce species movement. Such patterns may be desirable along the periphery of the corridor, where species conflicts with adjacent land uses and mortality may be elevated. In this way, the ADM uses patterns to direct movement to where it is most desirable within the corridor and discourage it elsewhere, thus increasing the corridor's function through design. Once all cells within the corridor are populated with the desired vegetation type, in the desired density and diversity, and are arranged in the desired spatial patterns, the ADM converts each cell to an appropriately coded and spatially explicit point. The ADM then links each point with a symbol unique to each plant type as a graphic component from the initial library. The result yields a modeled corridor that has been populated with unique vegetation types arranged in space. This output provides a physical design of the corridor's interior that is based on vegetation capability and customizable to address the requirements of varying species, such as the desert tortoise or javelina, and integrates patterns for guiding species' movement in the desired way. This represents a stark contrast to the ambiguous interior of a stand-alone modeled corridor and is envisioned to be a useful step in moving modeled outputs toward informed designs. The ADM populates the corridors with individual cells coded and arranged based on the optimal vegetation type and configuration for that location. This results in design guidance for both vegetation type and pattern integration, which can be utilized to create more functional wildlife corridors. Additionally, development of the ADM provides a more seamless design interface, allowing analysis, modeling, and design all to be completed within the ArcGIS environment without the need to export geospatial data to an alternative graphic design platform. This can be accomplished by using ADM-derived outputs within ArcScene. Additionally, this team believes that tools such as the ADM will aid in the development and design of functional wildlife corridors and contribute to the effectiveness of corridors as an increasingly viable conservation planning strategy. Further, the team believes that such developments will aid in spanning the gap between modeling, planning, design, and eventual implementation of wildlife corridors in a wide spectrum of planning applications. Ryan Perkl, PhD, is an assistant professor in the School of Landscape Architecture and Planning at the University of Arizona who specializes in environmental planning, wildlife connectivity modeling, and the emerging field of geodesign. Contributors to this work include Samuel Chambers, a doctoral student in arid lands resource sciences, and Brandon Herman, Wanyi Song, and Garrett Smith, all graduate students in planning at the University of Arizona. For more information, contact Ryan Perkl (e-mail: rperkl@email.arizona.edu) or visit www.planning.arizona.edu to learn more about the Planning Master's Degree Program at the University of Arizona. This work will be showcased in a talk entitled Employing an Automated Design Module (ADM) in Wildlife Corridor Design at the 2012 Esri International User Conference in San Diego, California. See also "The Importance of Connecting Protected Areas."